NFL cornerback: "Yeah, I am a virgin. I am not ashamed to say that." “Virgin” is really not a dirty word. 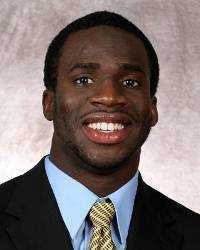 If you don't believe me, then ask football cornerback Prince Amukamara. He was the 2011 first round draft choice for the New York Giants. His recent statement to Muscle and Fitness Magazine -- “Yeah, I am a virgin. I am not ashamed to say that” -- should have sent shock waves through media outlets. But not much was mentioned. It has nothing to do with his skin color but rather a different type of racism that looks with disdain upon those who have the courage to declare that they are proudly pure in our over-sexualized culture riddled with debilitating STDs. It is okay to "come out of the closet" if the laundry you have to air is filthy. It is an altogether different story if you are displaying the virtue of virginity. Part of the beauty of this story has to do with his origins. Prince is not just his name, it is also his title. While he was born in Leominster, Massachusetts, he is of Nigerian ancestry. His grandfather is of Royal Igbo Nigerian descent and was the chief of Awo-Omamma in the Imo State of Nigeria. Prince Amukamura, age 24, is currently next in line to be the chief. That is what makes the story of Prince Amukamara so special. There are many who claim to be Catholic yet reject Church teaching on basic Christian morality. The last place one would expect to find a man like Mr. Amukamara is on the American gridiron where muscle-bound, ego heavy men perform for large crowds of adoring fans. It is for this reason that he has earned the title, among his teammates, of "The Black Tim Tebow." Such comparisons with Tebow, however, end there. While the liberal media scorned Tebow’s prayerful presence on the football field they could at least celebrate his deficiencies as a player. That’s certainly not the case with Prince Amukamara whose strength of virtue is matched by athletic talents which have earned him many accolades among fellow professionals. That means he is not going away any time soon and liberals will just have to swallow the fact that an NFL player, who also happens to be a Prince and a Roman Catholic, is not ashamed of being pure and does not consider "virgin" to be a dirty word. American men everywhere say: "Thank you, Prince!"